The free and easy style of sightseeing I had adopted in Venice, wasn’t without its drawbacks. I was halfway to the Basilica San Marco to book a place on the 11.00 am tour that would co-incide with the floodlighting of the mosaics, when it suddenly occurred to me that it was a Saturday. I knew the Rialto markets would be closed the next day. I was also aware that there would be no scheduled lighting of the mosaics on Sunday, and I was going to be returning home Monday morning. A quick decision was warranted. The market won. I doubled back and on to a vaporetto heading to the Rialto Mercato. The Rialto – a corruption of Rivo Alto meaning ‘high bank’ – was the heart of the confederation of island communities that was the Rialtini, long before Venice became a republic. The sacking of the then capital Malamocco in 810 by Charlesmagne’s son Pepin, and the Doge’s escape to this unassailable high ground, paved the way for Riva Alto to become the Cuore della Città, the new political and financial hub of the most powerful maritime empire of the time. And later Europe’s foremost mercantile exchange. The increased demand for trading space, and some say the objection to the stench of rotting produce by the banking establishments around, led to the transplanting of an existing market to the Eastern bank in 1097, where it functions to this day. The pontoon bridge built in 1181- the first of the four to connect the two sides – saw many transformations over centuries before attaining its new landmark stone incarnation. A great spot for photography if you manage to arrive well before the tourist hordes take over. It took considerable elbowing to capture my split second story! A still life painter’s dream, the erberia, encircled by muted pink and yellow palazzos, was brimming with artfully arranged luscious local produce sourced from outlying islands and the mainland. But it is the pescheria with its abundance of frutti di mare, that is the star attraction here. The picturesque covered seafood market with stone fish gargoyles adorning its columns, is one of only two places where fresh fish can be sold in the city (the other is the lesser known pescheria di San Marco near the mint). According to the Rialto Venezia website, fish mongers were traditionally expected to be Venetian natives over fifty years of age, specifically belonging to the regions of San Nicolo or the island of Poveglia, and needed to have a minimum of twenty years of fishing experience! Come to think of it, I didn’t spot a single vendor under the designated age! 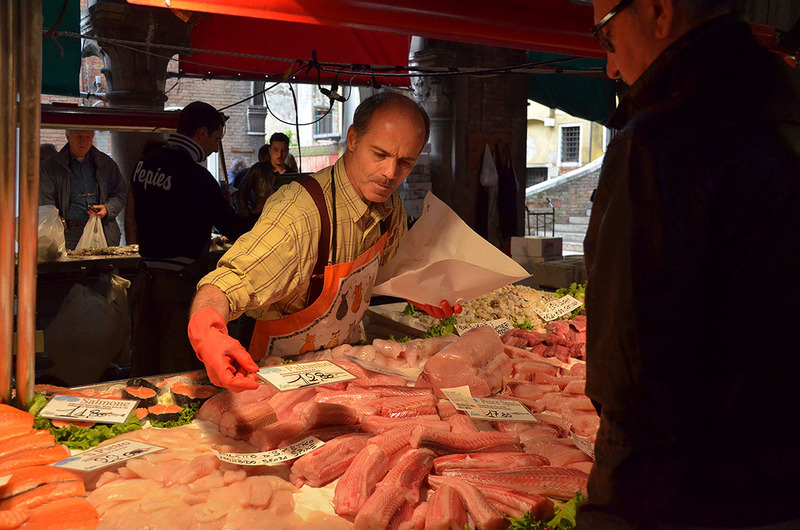 The pescheria briefly faced closure when plans were floated to shift the wholesale market from Troncetto near Piazzale Roma, to Fusina bordering the industrial zone, that would have made transporting fresh catch to Rialto unfeasible. Good sense obviously prevailed and the market lives on, to the relief of the 60000 or so locals, and the delight of tourists several times that number. Applauded no doubt by the greedy seagulls. I finished my visit at a deli nearby with a plate of decadently creamy baccalà mantecato (deep fried cod balls), washed down with a glass of sparkly prosecco. I wished I had one more day to revisit the mosaics. But I did not regret my decision even for a moment. gorgeous post Madhu … we have just been to the local fishmarket here in Brittany, very ugly surroundings but excellent fish …. we enjoyed langoustines for lunch! Thanks Christine, hope you have time to catch a few more markets in Paris before you leave. we did Madhu, but just the Bastille market, I was hanging out with the grandson most of the time! Wonderful …I love days like this! enchanting story, and photos that actually take you there Madhu! Glad you enjoyed it Maria. Thank you for stopping by to comment. Fabulous! I wish I could join you for a cup of tea somewhere. What a rich history of delectable treats! Mosaics for you next time! Great shot of the market-fresh vegetables. 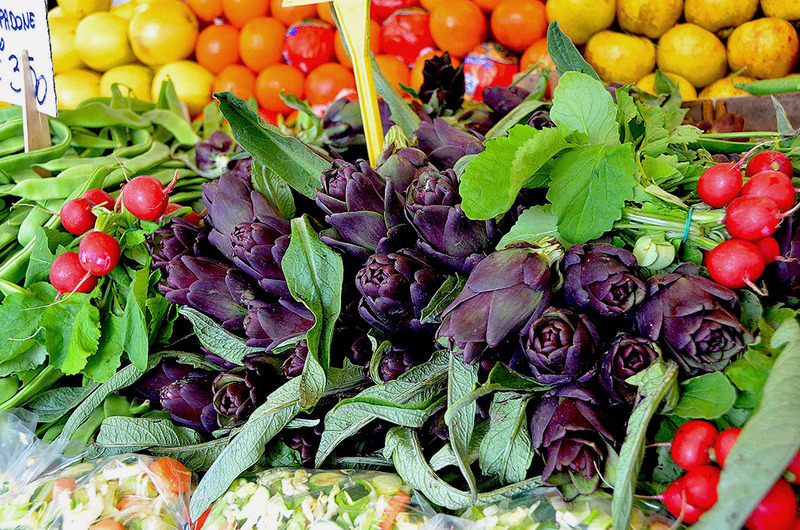 Guess those are purple artichokes. They are, apparently a specialty of the region along with the purple radicchio. The markets were a treat Gilly. The bonhomie between the vendors and customers was fascinating as well. The fish monger tradition must herald back to the days of guilds. Markets, especially the history of this one, makes it a worthy choice. Great captures, Madhu. Mosaics next time. Great market to visit! As always, beautiful shots! You called that right. Save the mosaics for another visit. The market offers stunning photo ops. The one of the erberia does look like a still-life painting. Beautiful. Thank you. Also I would not have had anything to show for the mosaic tour, since photography is forbidden! A very aromatic, historic and pictorial heart of Rialto. I am glad you made that quick decision. The ‘split second story’ is adorable. Love the history lesson- succinct and informative- beautifully written. Your pictures are gorgeous as well- thanks for a great post. Hilary, you were kind to read my post, and I’m happy that you enjoyed it. Thank you for the lovely comment! I’ve just moved into a flat near the Rialto and will be exploring the market on Monday morning! Your post brings it to life brilliantly, thanks! Thank you Liz. Hope your day at the Rialto was all that you expected it to be. Fascinating place, fascinating history. I must do a google search on this place to refresh my mind on that history again. It sure is Ian. There is plenty of information on the net. I worry about loading my posts with too much of it, especially with overdone destinations such as Venice. Thank you for reading Rlishman! Appreciate your taking the time to share your thoughts. It is LuAnn. And the history makes it even more worthwhile. 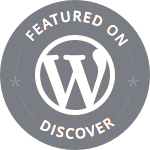 They are….for me too! Thank you for reading Eric. Have a great day. I am glad you went here. Thanks for showing us a different facet of Venice. Your photographs of the street life are gorgeous. Thanks for the bit of history, too. Twenty years fishing experience before you can sell them! Was this because you really need that much training to get the best price, you need that age bracket to get the best price, or just keeping the market closed to make sure young people had to work the young person’s job but at least there was a retirement pathway? It certainly makes sense, anyway. No wonder it’s persisted! I have no idea why Bronwyn, couldn’t find much on it online. But you are right, it does make sense. Thank you for reading. Superb shots, Madhu. What a fabulous visit you had, and the creamy deep fried cod balls sound absolutely heavenly. Yum! Endearingly captured! 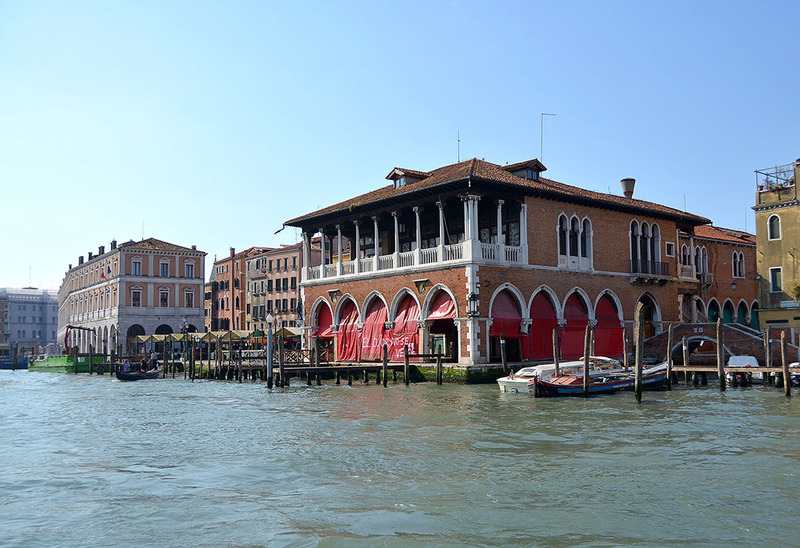 Such a relief the proposal to move the wholesale fish market didn’t go ahead – it’s hard to imagine Venice without the Rialto the way it is today. What a thrill it was to go and do my shopping! You’ve been hiding this one 😀 I haven’t seen it before!!! Did pigeons behave themselves in Venice? I am always drawn to produce markets, so I would have made the same decisions as you. I love being spontaneous, but I realised that without planning I would not get to see much…. True. Spontaneous works only when you are not constrained for time. Seemed like there were far fewer pigeons this time Paula. I remember being scared of them on our earlier visit! Away from San Marco you see more sea gulls than pigeons. 😀 Gulls over pigeons any day for me too!! True, a local market is a great place for photography.